Experience Red Roof PLUS+. Adding more WOW to your stay! Discover an enhanced experience with all new rooms and our most requested higher-end amenities. A completely remodeled and upgraded stay. Red Roof PLUS+ Houston Energy Corridor is located 'in the heart of the dynamic Houston Energy Corridor - home to the world's most powerful energy companies including BP, Shell, ExxonMobil, ConocoPhillips and Mustang Engineering. The hotel is right off of Interstate-10 West and minutes from Texas Children's Hospital, City Center, Memorial City Mall, Katy Mills Outlet and the Galleria. The thriving Katy community is less than three minutes away and offers an abundance of restaurants and neighborhood retail shopping. This West Houston hotel is also convenient to many parks, golf courses and entertainment complexes including George Bush Park, Merrell Center, Marq*E Entertainment Center, Toyota Center, Minute Maid Park , Reliant Stadium and Sam Houston Raceway Park. This 100% Smoke-Free Red Roof PLUS+ has been renovated and features free WiFi, an elevator, interior and exterior corridors and a fitness room. This Red Roof PLUS+ hotel also features Premium Rooms with breakfast and a snack ready in your room! Selected rooms offer microwave & refrigerator units. Experience our complimentary coffeehouse-style coffee and tea and grab-n-go breakfast in the lobby. This location offers On Command Video with a selection of free TV channels, pay-to-view premium channels, movies, music and games. In-room safe available for a nominal fee and one well-behaved family pet per room is welcome. Experience Red Roof PLUS+. Adding more WOW to your stay! Discover an enhanced experience with all new rooms and our most requested higher-end amenities. A completely remodeled and upgraded stay. Red Roof PLUS+ Houston Energy Corridor is located in the heart of Houston's prestigious Energy Corridor - home to the world's most powerful energy companies including BP, Shell, ExxonMobil, ConocoPhillips and Mustang Engineering. The hotel is right off of Interstate-10 West and minutes from Texas Children's Hospital, City Center, Memorial City Mall, Katy Mills Outlet and the Galleria. The thriving Katy community is less than three minutes away and offers an abundance of restaurants and neighborhood retail shopping. 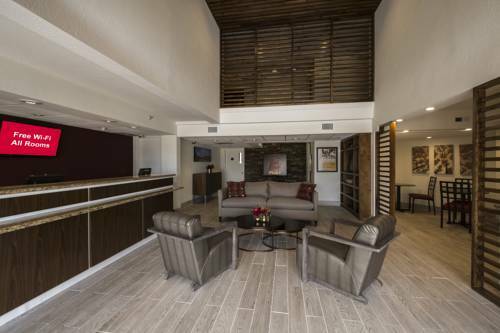 This West Houston hotel is also convenient to many parks, golf courses and entertainment complexes including George Bush Park, Merrell Center, Marq*E Entertainment Center, Toyota Center, Minute Maid Park , Reliant Stadium and Sam Houston Raceway Park. - Diamond OffShore Drilling Inc.